Suppression of bone marrow myeloid and erythroid progenitor cells occurs after infection with a variety of different viruses. In this study, we characterize the alterations in bone marrow (BM) lymphocytes after influenza virus infection in mice. We found a severe loss of BM B cells, particularly CD43low/−B220+ pre-B and immature B cells, in influenza virus-infected mice. Depletion of BM B lineage cells resulted primarily from cell cycle arrest and most likely apoptosis within the BM environment, rather than from increased trafficking of BM emigrants to peripheral lymphoid tissues. Use of gene-knockout mice indicates that depletion of BM B cells is dependent on TNF-α, lymphotoxin-α, and both TNF receptors, TNFR1-p55 and TNFR2-p75. Thus, TNF-α and lymphotoxin-α are required for loss of BM B lineage cells during respiratory infection with influenza virus. Failure of bone marrow (BM)3 myeloid and erythroid precursor cells during or after virus infection with hepatitis A, B, and C (1, 2), EBV (3), CMV (4), dengue virus (5), HIV (6), and parvovirus B19 (7) is well-documented. In humans it is often manifested clinically as aplastic anemia and cytopenia. A number of mechanisms have been proposed to account for virally induced BM suppression, depending on the specific virus involved. These include a virus-induced suppression of hemopoietic progenitor cells due to direct infection and lysis of the progenitor cells themselves, such as by parvovirus (7), CMV (8), and dengue virus (9), altered ability of BM stromal cells to support progenitor cell development due to aberrant stromal cell cytokine expression (10), or immunosuppressive immune cell cytokines that are released from virally activated cells. For example, TNF-α, lymphotoxin-α (LTα), and immune IFN, induced during virus infection, can influence the development of BM progenitor erythroid- and myeloid-lineage cells in vitro (11, 12, 13). Despite the many clinical observations showing hemopoietic abnormalities associated with virus infection, most studies have focused on documenting virus-induced effects on myeloid and erythroid lineage cells, and correlated the in vitro activities of hemopoietic or suppressive cytokines, chemokines, and other growth factors, on these cells. Surprisingly, there are few reports on alterations in BM lymphocytes during virus infection in vivo, the mechanisms by which they occur, or their clinical consequences. Although a great deal is known about the host immune response to influenza virus infection (14), no information is available regarding the effects of an acute respiratory infection with influenza virus on BM lymphocytes. In this study, we document the effect of respiratory infection with a type A H3N2 influenza virus on BM B lineage cells in mice. In this model, mice are infected intranasally (i.n. ), and virus replicates in the respiratory tract until it is cleared ∼10 days postinfection (p.i.) (15). Developmental progression of BM B lineage cells is monitored by markers B220/CD45R, CD43, IgM, and IgD, which distinguish the various maturation states of B cells that reside within the BM (16). Progenitor (pro-) B cells are CD43highB220+ IgM− and develop into precursor (pre-) B cells that are CD43low/−B220+ IgM−, before becoming CD43−B220+ IgM+IgD− immature B cells. Immature B cells differentiate to become heat-stable Ag (HSA)+ transitional B cells, move to the periphery (17), and complete their differentiation in the spleen before entering the mature B cell pool (18, 19, 20). BM B220high IgM+IgD+ CD43− cells in the BM are mainly mature naive recirculating B cells (21, 22). Using Abs to these markers, we show that murine BM B lineage cells are severely depleted in vivo during influenza virus infection, most likely via the process of cell cycle arrest and apoptosis, and provide evidence that BM B cell loss is dependent on TNF-α and LTα. Wild-type (WT) C57BL/6 (B6) mice were obtained from Department of Laboratory Animal Science (University of Otago, Dunedin, New Zealand), Institute of Animal Health (Compton, U.K.), Animal Resource Center (Perth, Western Australia), or from Taconic Farms (Germantown, NY). WT BALB/c, 129/C57BL/6 (129/B6) F2, β2-microglobulin−/− (23), IFN-γ−/− (24), Fas ligand (L)-deficient B6.gld (25), and Fas-deficient B6.lpr mice were all obtained from The Jackson Laboratory (Bar Harbor, ME). B6.TNF-α−/−LTα−/− (26) and 129/SvIFNαβR−/− mice (27) were obtained from B&K Universal (Hull, U.K.) or from Centenary Institute for Cancer Medicine and Cell Biology (Sydney, Australia), while 129/B6.TNF-α−/− mice (28) were generously provided by Dr. M. Marino (Ludwig Institute for Cancer Research at Memorial Sloan Kettering Cancer Center, New York, NY). 129/B6.LTα−/− mice were kindly provided by Dr. D. Chaplin (Washington University School of Medicine, St. Louis, MO). B6.TRAIL/Apo2L−/−, B6.TNFR1-p55−/−, B6.TNFR2-p75−/− (all five generations backcrossed onto B6), and B6.TNFRp55−/−p75−/− mice (four generations backcrossed onto B6) were generated at Immunex (Seattle, WA) and have been described previously (29, 30). At Immunex and Edward Jenner Institute for Vaccine Research, mice were held under specific pathogen-free conditions. Mice were used between 8 and 12 wk of age and animal studies were approved by the relevant ethics authorities. The HKx31 (H3N2) strain of influenza A virus (x31) was grown in the allantoic fluid (AF) of 10-day-old embryonated hen eggs (obtained from the Poultry Production Unit, Institute of Animal Health). Virus stocks used for infecting mice were sterile and endotoxin-free. Mice were anesthetized by i.p. injection of avertin or ketamine/xylazine (Sigma-Aldrich, St. Louis, MO), and infected i.n. with x31 equal to 4 × 105 50% egg infectious dose (EID50). In this model, the virus replicates in the lungs but is cleared by 10 days p.i. During this time mice show no signs of morbidity. However, because TNFR−/− mice are more susceptible to virus infection (31) and this dose of x31 is lethal in TNFR−/− mice (L. M. Sedger, unpublished observations), a dose equivalent to 5 × 104 EID50 influenza virus was used in experiments using LTα−/−, TNF-α−/−, and TNF-α−/−LTα−/− mice, including WT or +/+ littermates. Importantly, both the 4 × 105 and 5 × 104 EID50 inoculum of x31 virus induce similar levels of BM depletion in C57BL/6 WT mice (L. Hyland, unpublished observations). For controls, mice were inoculated i.n. with an equal volume of uninfected AF preparation. For secondary challenge, mice were infected with 1 × 107 EID50 of x31 virus. During secondary infection, virus is cleared more rapidly and mice are protected from significant virus replication by the presence of circulating Abs that arise during the primary infection. Respiratory syncytial virus (RSV) (A2 strain) was grown and titered on BSC-1 (CCL-26; American Type Culture Collection) cells, and WT mice were infected with 2 × 105 PFU RSV i.n. As in the x31 model, RSV-infected mice show no sign of morbidity, but virus is easily detected by PCR in lung tissue or bronchial aspirates. BM leukocytes were collected from individual x31- or AF-inoculated mice in 1 ml of medium without serum and 0.1 ml (and 10-fold dilutions) injected directly into the allantoic cavity of 10-day-old eggs. Eggs were incubated for 72 h at 37°C in a humidified incubator, and AF from each egg was collected and tested for hemagglutinating activity using chicken RBCs by standard techniques (32). Bone marrow cells were also assessed for the presence of viral RNA by RT-PCR. Briefly, total cellular RNA was isolated using RNeasy minicolumns (Qiagen, Valencia, CA) from BM leukocytes of mice 3 and 5 days p.i., from uninfected mice, and from the lungs of the x31-infected mice 3 days p.i. for a positive control. First-strand cDNA was synthesized using Superscript Preamplification System (Life Technologies, Grand Island, NY), and PCR was then conducted with influenza A nucleoprotein-specific primers 5′-GGGAAAGATCCTAAGAAAAC and 5′-TGCACTTTCCATCATCCTTA as described (33). PCR products were resolved by agarose gel electrophoresis and sequenced to verify identity. BM cells were collected from the femurs and tibias of mice, erythrocytes were lysed with NH4Cl lysis buffer, and BM leukocytes were then analyzed from mice individually. BM cells were incubated for 1 h in FACS blocking buffer (PBS containing 2% rat serum, 2% goat serum, 2% FCS, and anti-FcR-blocking Ab 2.4G2), and then incubated for 45 min at 4°C with FITC-, PE-, biotin-, or allophycocyanin-conjugated anti-CD43 mAbs (S7), anti-IgD mAb (217-170), anti-B220 mAb (RA3–6B2) (all BD PharMingen, San Diego, CA), or anti-IgM (Southern Biotechnology Associates, Birmingham, AL), and streptavidin-PE (Sigma-Aldrich), or streptavidin-allophycocyanin (BD PharMingen). TNFR expression was analyzed using hamster anti-murine TNFR1 mAb and hamster anti-murine TNFR2 mAb (R&D Systems, Minneapolis, MN) that were biotinylated at Immunex, and a biotinylated hamster isotype control Ab (BD PharMingen). For detection of Fas, TRAILR and osteoprotegerin (OPG) cells were incubated with leucine zipper (LZ)-tagged proteins, LZ-murine TRAIL, LZ-human FasL, or LZ-murine receptor activator of NF-κB (RANKL, Immunex), at 10 μg/ml, washed, then incubated with 10 μg/ml biotinylated anti-LZ Ab M15 (Immunex), then streptavidin-APC, together with PE-conjugated anti-CD43 mAb and FITC-conjugated anti-B220 mAb. In all experiments, total BM leukocyte-gated (residual erythrocytes only excluded) cells were analyzed (30,000 events) on a FACSCalibur or a FACScan flow cytometer (BD Biosciences, Mountain View, CA), using CellQuest software (BD Biosciences). Cell cycle analysis was performed using propidium iodide (Sigma-Aldrich) as described (34). In this case, 100,000 ungated events were collected, regions representing doublets and debris were excluded by gating, and histograms were analyzed using Modfit LT DNA software (Verity Software House, Topsham, ME). Apoptosis was assessed by estimating the number of hypodiploid cells by propidium iodide staining of short-term BM cultures, as described (35). BM suspensions were prepared from four mice 3 days post x31 or AF inoculation, cultured in methylcellulose medium containing 10 ng/ml recombinant human IL-7 (StemCell Technologies, Vancouver, British Columbia, Canada) for 6 days at 37°C with 5% CO2 and colonies were counted. Short-term cultures of total BM cells were also used to assess apoptosis of B220low B lineage cells using propidium iodide staining, as described above. TNF-α and LTα mRNA in BM leukocytes was assessed by RT-PCR, as described above. TNF-α-, LTα-, and GAPDH-specific cDNAs were amplified using the following primers: TNF-α, 5′-CTCCAGCTGGAAGACTCCTCCCAG and 5′-AAAGCATGATCCGCGACGTGGAA; LTα, 5′-CCGGATACACAGACTTCTGC and 5′-CCATGGCATCCTGAAACCTGCT; and GAPDH, 5′-TGCTGAGTATGTCGTGGAGTCTAC and 5′-ATCACGCCACAGCTTTCCAGAG. PCR conditions were 94°C for 15 min, then 28 cycles of 94°C for 1 min, 50°C for 1 min, 72°C for 1 min for TNF-α and LTα amplification, or 26 cycles for GAPDH. Serum TNF-α was measured by ELISA, using purified goat IgG anti-murine TNF-α (AF-410-NA) and biotinylated goat IgG anti-murine TNF-α Abs (BAF-410; R&D Systems) essentially as directed by the manufacturer. The limit of sensitivity of this assay was calculated to be 30 pg/ml. Intracellular BM leukocyte TNF-α was also detected by treating cells with 10 μg/ml brefeldin A for 3 h, then incubating in rat anti-mouse TNF-α-PE (clone MP6-XT22; BD PharMingen) in the presence of 0.1% saponin followed by flow cytometry. Alveolar macrophages (Mφ) were depleted with clodronate liposomes i.n., on days 2 and 4 preinfection (36), and depletion was assessed by acid phosphatase staining of bronchoalveolar lavage cells using napthol-As-Bi-phosphate (Sigma-Aldrich). Using this method, ∼75–80% alveolar Mφ are depleted by the day of infection (data not shown). Control mice were treated with PBS-liposomes. NK cells were depleted by injecting 1 mg i.p. of mAb TMβ1, 2 days before infection (rat IgG2b anti-IL2Rβ; Ref. 37); the isotype control Ab YKIX 716.13 was used for control mice (38). This protocol depletes NK cells specifically for up to 5 wk (37). CD4+ T cells were depleted by i.p. injections of 0.5 ml of GK1.5 mAb anti-murine CD4 every 3 days, which specifically depletes >98% CD4+ T cells in vivo (39). Where appropriate data was analyzed statistically using an unpaired Student’s t test, p values are stated in the text to indicate the level of statistical significance. The number of individual replicates used to generate means for each experiment is mentioned in the figure legend. Using Abs to B lineage markers and 2- or 3-color flow cytometry, we characterized the alterations in BM lymphocytes during i.n. infection with x31 influenza virus in mice. Using this model, we observed a progressive loss of pre-B and immature B cells within the BM of x31 infected mice 3–9 days p.i., but no statistically significant alteration in AF control-inoculated mice (Fig. 1⇓A). The pre-B/immature B CD43low/−B220+ cell population declined from 15 ± 1% (4.2 ± 0.82 × 106) of total nucleated BM cells in naive mice to 2 ± 0.6% (5.6 ± 0.44 × 105) 7–9 days after infection with influenza virus (Fig. 1⇓A, p = 0.0001). Depletion of pre-B and immature B cells is also detected by double-staining with IgM and B220 (Fig. 1⇓B). B220lowIgM− cells are mainly pre-B cells although pro-B cells are also included in this population. This population declined from 13 ± 3% (3.6 ± 0.76 × 106 cells) in control AF-treated mice to 3 ± 0.3% (1.5 ± 0.42 × 106 cells) on day 7 p.i. (Fig. 1⇓B, p = 0.0001). Immature B220lowIgM+ B cells also declined from 4 ± 0.7% in AF-inoculated mice (or 5 ± 0.1% in naive mice) to 1 ± 0.1% in x31-infected mice 7–9 days p.i. (Fig. 1⇓B, p = 0.0001). Interestingly, the CD43− IgM+B220high cells were also reduced in BM from x31-infected mice. These cells are thought to comprise mainly mature recirculating B cells. It is unclear whether this reduction is a consequence of the loss of immediate precursor cells or an effect on mature recirculating B cells. By comparison, the Gr1+ myeloid BM population was unaltered after influenza virus infection (data not shown), while the Ter119+ BM erythroid cell population actually increased from 34 ± 1% in uninfected mice to 65 ± 6.1%, 3 days p.i., before slowly returning to normal over the course of the infection. BM B lineage cells are depleted and the multilineage precursor cell population increases in size following primary influenza virus infection. BM cells from C57BL/6 mice were harvested at various times points post x31 influenza virus infection, or administration of AF, incubated with (A) PE-conjugated anti-CD43 and FITC-conjugated anti-B220, or (B) PE-conjugated anti-IgM and FITC-conjugated anti-B220, and analyzed by two-color flow cytometry. CD43low/−B220+ cells are the pre-B/immature B cell population. B220lowIgM− cells define pre-B and pro-B cells, B220lowIgM+ cells are immature B cells and B220highIgM+ cells are mainly mature naive recirculating B cells. Percentages shown are calculated from total nucleated BM leukocytes (erythrocyte-depleted). Data shown in A and B are two-color dot plots from an individual mouse, but are representative of three mice per group, per time point, and of three independent experiments. Despite the depletion of pre-B and immature B cells that occurred within the BM, the number of nucleated BM cells in marrow harvested from influenza virus-infected mice 7 days p.i. (3.4 ± 0.2 × 107 cells) was very similar to that found in BM obtained from naive mice (3.3 ± 0.8 × 107 cells; not statistically significantly different; p = 0.82). Consistent with this finding, there was a concomitant increase in the CD43+B220− cell population (containing lymphoid and myeloid progenitors as well as pluripotent hemopoietic stem cells) from 47 ± 3.7% of nucleated BM cells in naive mice and 49 ± 4.9% in AF-inoculated mice, to 71 ± 2.7% in x31-infected mice 7 days p.i. (Fig. 1⇑A; statistically very significant; p = 0.0024). Interestingly, similar changes also occurred in mice undergoing a secondary infection with the same virus, although the loss of CD43low/−B220+ pre-B and immature B cells and the increase in CD43+B220− cells occurred more rapidly (data not shown). All of these effects were transient, and BM cell populations returned to normal numbers by approximately day 15 post primary or day 10 post secondary infection (Fig. 1⇑ and data not shown). Thus, respiratory influenza virus infection induces dramatic alterations of BM leukocytes, especially B lineage cells, in mice. To determine whether the loss of BM B lineage cells represents their early exit from the BM, the number of B220+IgM− (pre-B phenotype) or CD43low/−B220+ (pre-B/immature B phenotype) cells in the blood, spleen, or mediastinal lymph nodes of x31-infected mice on days 4 and 7 p.i were assessed. No increase in the numbers of B220+IgM− or CD43low/−B220+ cells could be detected in the blood of x31-infected mice on day 4 p.i., compared with control mice (data not shown). There were also no distinct populations of B220+IgM− or CD43low/−B220+ cells in the spleens of AF- or x31-inoculated mice 4 days p.i. (data not shown). Moreover, on day 7 p.i., there were no differences in the number or percentage of B220+IgM− or CD43low/−B220+ cells (1–2%) in either the blood or spleens of AF-treated compared with x31-infected mice. In contrast, it is well-documented that the mediastinal lymph node increases in size and lymphoid cellularity after influenza virus infection (39). Consistent with this, we noted a 5- to 6-fold increase in the cellularity of this organ by day 4 p.i. in x31-infected mice (11 ± 3.5 × 106 cells), and a 7-fold increase by day 7 p.i. (12 ± 4.4 × 106 cells) compared with control AF-inoculated mice (1.7 ± 0.54 × 106). However, there was no increase in the number of B220+IgM− or CD43low/−B220+ cells in the mediastinal lymph nodes of infected mice when compared with AF-inoculated mice (data not shown). To confirm these findings, the numbers of HSAhigh transitional BM B cells exiting the BM was assessed by looking for an increase in B220lowIgMhighHSAhigh cells which represent recently emigrated transitional BM cells (18, 19). A statistically significant decrease in mature IgM+ B cells, IgD+ B cells, and HSAhigh B cells was evident in the peripheral blood of x31-infected mice at day 4 p.i. (Table I⇓), but there was no significant difference in the number or percentage of B220lowIgMhighHSAhigh B cells in the spleen of x31-infected mice, compared with AF-inoculated mice (data not shown). Consistent with previous reports, B220lowIgMhighHSAhigh transitional B cells were not found in mediastinal lymph nodes (20). Although recently emigrated B cells might represent <1% of the total peripheral leukocyte pool, sensitive flow cytometry analysis of multiple peripheral lymphoid tissues, that is, spleen, (draining) mediastinal lymph nodes, and peripheral blood, failed to detect any increase in these cells. Thus, influenza virus-induced BM B cell depletion was unlikely to be due to an abnormally early exit of these cells out of the BM environment into the periphery. Conversely, the kinetics of early B cell depletion coincided with a decrease in recently emigrated HSA+ transitional B cells in the peripheral blood. It was possible that BM B lineage cell loss was due to cell cycle arrest followed by cell death within the BM. Therefore, the cycling characteristics of different BM B cell populations was assessed during the course of influenza infection. 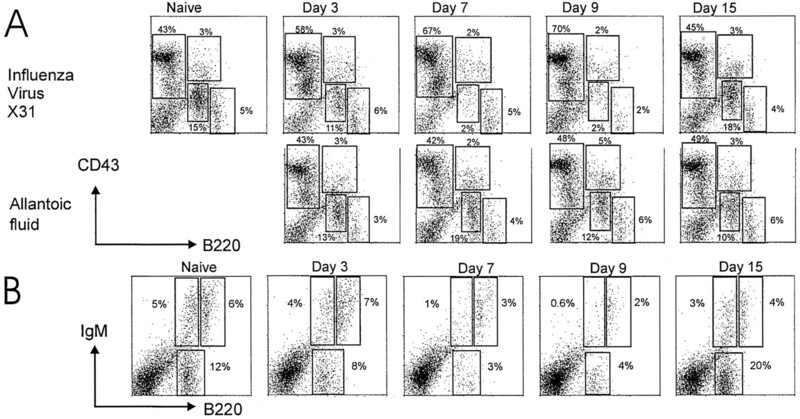 B220low cells (pro-B, pre-B, and immature B cells) in the S phase of the cell cycle were decreased 3-fold from 22.7 ± 1.5% in naive mice to 8.5 ± 2.9% in x31-infected mice 3 days p.i, but there was no difference between AF mice and naive mice (Table II⇓). Thus the progression of early B cells into S phase of the cell cycle is blocked in influenza virus-infected mice, and this coincided precisely with the initial detectable loss of BM B cells (Fig. 1⇑A). The number of hypodiploid proapoptotic cells present in in vitro cultures was also assessed, to determine whether the loss of BM B-lineage cells was due to apoptosis subsequent to cell cycle arrest. Because most lymphocytes undergoing apoptosis in vivo are often undetectable due to their rapid recognition and efficient removal by phagocytic cells, examination of short-term BM cultures (35) provided a way to assess the number of hypodiploid proapoptotic cells present in the BM. There was a significant increase in BM hypodiploid B220low cells (21.6 ± 5%; mean ± SD of three mice) in x31-infected mice 3 days p.i compared with AF-treated (12.7 ± 2.1%) or naive mice (13.6 ± 1.2%; Fig. 2⇓ shows a representative experiment). There was no significant difference between AF and naive BM after culture. BM cells taken from mice 7 days p.i. also showed increased numbers of hypodiploid cells in short term culture assays (data not shown). This is in comparison to the fact that <1% hypodiploid cells are present in fresh (uncultured) naive BM cell suspensions (data not shown) but are consistent with the known poor viability and high rate of background cell death of B cells in culture (40). Thus, during influenza virus infection, BM B lineage cells undergo cell cycle arrest and depletion, likely due to apoptosis, within the marrow environment. The percentage of B220low BM B cells undergoing apoptosis is increased in mice 3 days post influenza virus infection. Freshly harvested BM cells were plated at 1 × 106cells/ml for 24 h at 37°C. Cells were subsequently stained with FITC-conjugated anti-B220 mAb followed by propidium iodide. The number of hypodiploid cells was estimated by collecting 100,000 ungated events. A, BM from mice 3 days after infection with influenza virus; B, BM from mice 3 days after treatment with AF; C, BM from naive mice. Data shown are BM cells from an individual mouse, but are representative of four mice per group and three independent experiments. Finally, proliferation of BM progenitor B cells was assessed using pre-B cell colony-forming assays. Consistent with the cell cycle and apoptosis results, there were 1.6-fold fewer pre-B cell colonies present in BM cultures derived from x31-infected mice 3 days p.i. (96 ± 37 colonies/5 × 105 cells) compared with AF-inoculated mice (160 ± 21 colonies/5 × 105 cells, p = 0.056), but no difference in the numbers of pre-B cell colonies from BM obtained from AF-inoculated mice and naive mice (data not shown). Thus, influenza virus infection caused a severe depletion of, and concomitant block in, proliferative potential of BM pre-B cells. Next, we assessed whether BM B-lineage cell loss was an influenza virus-specific phenomenon, and whether another respiratory virus also induced BM B cell depletion. Infection with β-propiolactone-inactivated (41) influenza virus did not cause BM B cell loss, nor did i.n. infection with RSV (data not shown). Furthermore, depletion of early BM B cells was an indirect virus-mediated effect because no infectious virus particles were detectable in BM during the week following infection, as assessed either by culturing total BM cells in embryonated eggs for isolation of infectious influenza virus, or by RT-PCR analysis for influenza virus nucleoprotein RNA (data not shown). For control purposes, nucleoprotein-specific RT-PCR products were found to be abundant in RNA extracted from lung tissue at day 3 p.i. and amplification of GAPDH was similar in all samples (data not shown). These data are consistent with the fact that influenza virus is known to replicate almost exclusively in the lungs, and systemic viremia does not normally occur (14). Thus, in the i.n. infected mouse model, BM B cell loss is due to an influenza virus-specific effect requiring infectious, replicating virus, but occurs via an indirect mechanism. Because BM B cell loss appeared to be due to apoptosis within the BM environment, BM cells were examined by flow cytometry to determine expression of apoptosis-inducing receptors that might mediate x31-induced cell death. High levels of Fas expression were detected on total heterogeneous BM B cells (Fig. 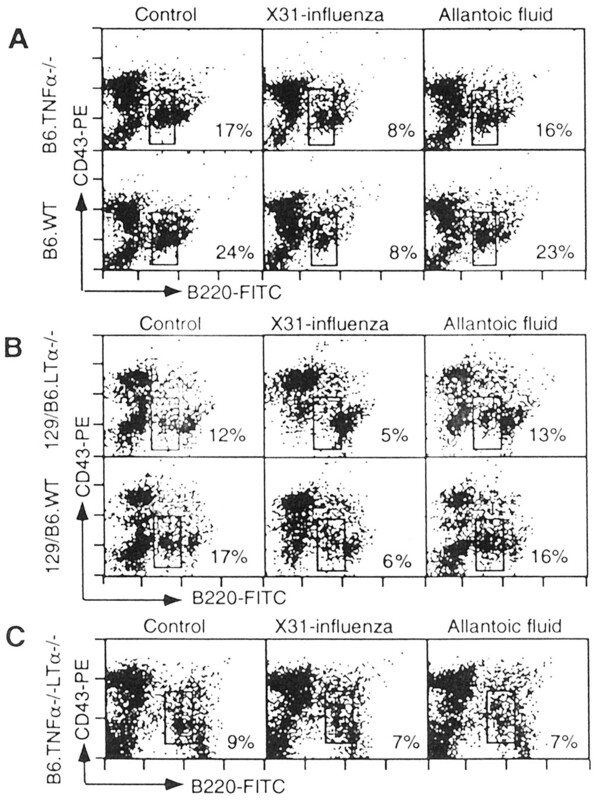 3⇓A), as well as on the CD43low/−B220+ pre-B/immature B cell population (Fig. 3⇓B). Total BM cells and CD43low/−B220+ pre-B/immature B cells were also found to bind LZ-murine TRAIL, but not LZ-murine RANKL, indicating authentic expression of TRAILR protein (but not OPG or RANK) on CD43low/−B220+ pre-B/immature B cells. By comparison, total BM cells express only very low levels of both TNFR1-p55 and TNFR2-p75 (Fig. 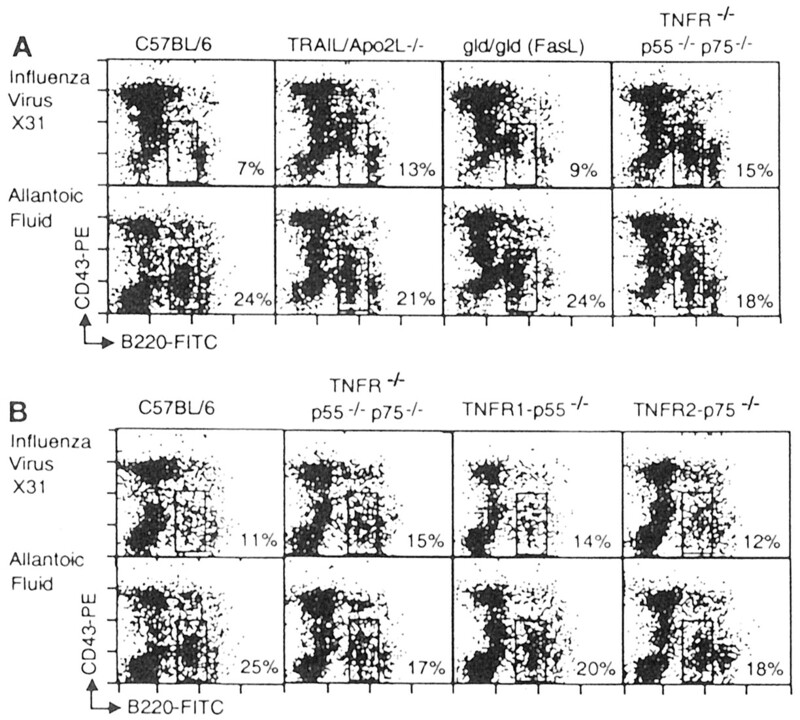 3⇓A), and only TNFR2-p75 was clearly detectable on CD43low/−B220+ pre-B/immature B cells (Fig. 3⇓B). Thus x31-induced BM B cell loss might be triggered through FasL-Fas, TRAIL/Apo2L-TRAIL-R, or TNF-α-TNFR interactions. Flow cytometric analysis of death receptor expression on murine BM cells. BM cells were harvested from naive C57BL/6 mice and stained with LZ-tagged ligands to assess specific death receptor expression. LZ-murine RANKL, LZ-murine TRAIL, and LZ-human FasL are shown (solid line) against staining with secondary reagents only (shaded histograms). Staining with TNFR1-p55- and TNFR2-p75-specific hamster mAbs (solid lines) are shown compared with staining with a hamster isotype control Ab (gray histograms). A, Expression of OPG or RANK, TRAILR, Fas, TNFR1-p55, and TNFR2-p75 on total ungated BM leukocytes. 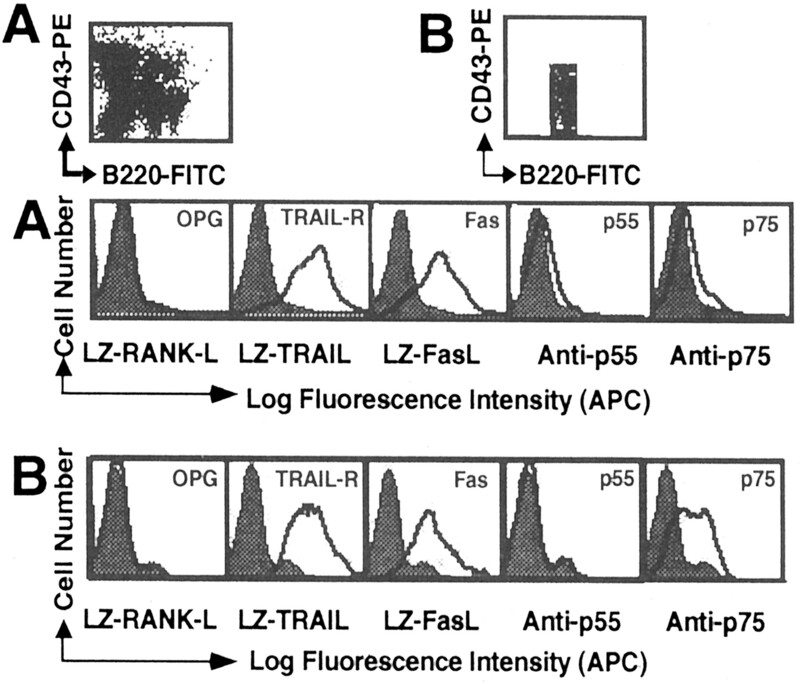 B, Expression of OPG or RANK, TRAILR, Fas, TNFR1-p55, and TNFR2-p75 on CD43low/−B220+ pre-B/immature B cells. Data shown are pooled cells from three mice per group and are representative of three independent experiments. If cell loss occurs by apoptosis mediated by a death-inducing receptor, then mice deficient in that specific receptor, or its cognate ligand, should be protected from BM B cell loss during influenza virus infection. For this reason, C57BL/6.lpr (Fas-mutant), C57BL/6.gld (FasL-deficient), C57BL/6.TRAIL/Apo2L−/−, and C57BL/6.TNFRp55−/−p75−/− double receptor-deficient mice were inoculated with x31 or AF and BM cells examined by three-color flow cytometry on day 6 p.i. Mice deficient in Fas (lpr mice, data not shown), FasL (gld mice), or TRAIL/Apo2L still exhibited statistically significant BM pre-B/immature B cell depletion after influenza virus infection compared with AF-inoculated mice (p = 0.0046, p = 0.0309, p = 0.0036 respectively; Fig. 4⇓A). Thus, neither FasL-Fas nor TRAIL/Apo2L-TRAILR interactions are essential for this phenomenon. In contrast, 15% CD43low/−B220+ BM cells were still present in influenza virus-infected TNFR-p55−/−p75−/− double receptor-deficient mice, which is very similar to 18% CD43low/−B220+ cells in control AF-inoculated mice (p = 0.287; not significantly different; Fig. 4⇓A). Although only TNFR1-p55 contains a caspase-activating death domain, it has been shown that both TNFRs can signal TNF-α-induced cell death (42). To determine whether the death domain containing TNFR1-p55 mediated the BM B cell loss or whether TNFR2-p75 also contributed, TNFR1-p55−/− and TNFR2-p75−/− single receptor-deficient mice were examined. However, mice deficient in either TNFR1-p55 or TNFR2-p75 were both found to be only partially resistant to influenza virus-induced BM B cell loss. Indeed, 14% CD43low/−B220+ cells were present in x31-infected TNFR1p55−/− mice and 12% CD43low/−B220+ cells in TNFR2-p75−/− mice, compared with 18 or 20% in AF-inoculated mice, respectively (p = 0.0705, not quite significantly different; Fig. 4⇓B). Thus, influenza virus-induced BM B cell loss is mediated through both TNFR1-p55 and TNFR2-p75, consistent with the idea that BM B cell loss occurs through apoptosis. Flow cytometric analysis of BM B cell depletion in death-inducing ligand or receptor-deficient and knockout mice. A, BM CD43low/−B220+ (boxed region) pre-B/immature B cells in WT C57BL/6 mice, C57BL/6 TRAIL/Apo2L−/− mice, C57BL/6 FasL-deficient gld mice, and TNFRp55−/−p75−/− mice. B, BM CD43low/−B220+ (boxed region) pre-B/immature B cells in WT mice, TNFR double receptor-deficient mice, or mice deficient only in TNFR1-p55 or TNFR2-p75. Data shown are representative of BM cells harvested at the same time and pooled from three mice per group 6 days p.i. with 5 × 105 EID50 x31. Data shown are representative of two independent experiments. Because both TNF-α and the soluble form of LTα (LTα3) are known to bind TNFR1-p55 and TNFR2-p75, we also attempted to define which of these ligands were responsible for the TNFR-mediated B cell depletion. However, mice deficient in either TNF-α or LTα still exhibited statistically significant BM B cell loss after influenza virus infection (p = 0.0309 and p = 0.0309, respectively; Fig. 5⇓, A and B). To investigate the possibility that both ligands were involved, we used TNF-α−/−LTα−/− double-deficient mice. Although TNF-α−/−LTα−/− mice appear to have fewer CD43low/−B220+ pre-B/immature B cells compared with normal B6 mice, these cells were resistant to BM pre-B/immature B cell depletion after influenza virus infection, because the percentage of pre-B/immature B CD43low/−B220+ cells in BM from x31-infected TNF-α−/−LTα−/− mice (7.3 ± 0.9%) was identical to that found in AF-inoculated mice (7.2 ± 0.1%, p = 1.0; Fig. 5⇓C). Note that because the TNF-α−/−, LTα−/−, and TNF-α−/−LTα−/− mice are on different genetic backgrounds (see Materials and Methods and Fig. 5⇓), relevant WT control mice were used in all cases. Irrespective of this difference, relevant comparisons can be made between x31- and AF-inoculated mice. Taken together, these observations also closely resembled those in TNFR-p55−/−p75−/− mice (Fig. 4⇑A). These data strongly suggest that x31-induced BM B cell loss requires not only TNFR1-p55 and TNFR2-p75, but that both TNF-α and LTα also play a role. Alternatively, it is unclear whether the early BM B cells in TNF-α−/−LTα−/− mice are more resistant to influenza virus-induced cell loss or whether the “sensitive” BM B cell populations are strangely already absent in TNF-α−/−LTα−/− mice. This seems an unlikely explanation for the data, because similar results were observed in TNFR-p55−/−p75−/− mice (see Fig. 4⇑). Flow cytometric analysis of BM B cell depletion in TNF-α−/−, LTα−/−, or TNF-α−/−LTα−/− double-deficient mice after influenza virus infection. A, BM CD43low/−B220+ (boxed region) pre-B/immature B cells in control uninfected WT B6.TNF-α−/− mice, or B6.WT mice, 6 days post influenza virus infection, or 6 days post inoculation with control AF. B, BM CD43low/−B220+ (boxed region) pre-B/immature B cells in control uninfected WT 129/B.F2 mice, or 129/B6.F2 LTα−/− mice 6 days post x31 or AF inoculation. C, BM CD43low/−B220+ (boxed region) pre-B/immature B cells in naive uninfected B6. TNF-α−/−LTα−/− double-deficient mice, or 6 days post x31 or AF inoculation. BM dot-plots from B6.TNF-α−/−LTα−/− double-deficient mice only are shown in C, due to the altered BM cellular composition and dot-plot profiles of these mice compared with WT mice. For this reason, valid comparisons can only be made between x31- and AF-inoculated B6. TNF-α−/−LTα−/− mice. Data shown are BM leukocytes from an individual mouse, which are representative of three individual mice per group, each infected with 5 × 104 EID50 x31 and of three independently repeated experiments. The requirement for TNF-α and LTα indicates that specific effector cells may mediate x31-induced BM B cell loss. Thus, BM cells from influenza virus-infected and AF-inoculated gene knockout mice which were deficient in particular cell types or specific cytokines, were assessed. We found that mice deficient in CD4+ T cells (CD4+ T cell-depleted mice), CD8+ cells (β2m−/− mice; Ref. 23), alveolar macrophages (liposome-treated mice; Ref. 36), or NK cells (TMβ1 Ab-treated; Ref. 37), or peripheral NK cells (IL-15−/− mice; Ref. 43), still exhibited marked BM B cell depletion following influenza virus infection (data not shown). Hence, although these treatments result in >90% depletion of T cells, NK cells, and 75–80% of alveolar macrophages (data not shown), and despite the fact that specific cell populations are completely absent in the gene knockout mice, there was no reduction in the depletion of BM B cells in any of these x31-infected mice. Thus, significant alterations in the absolute number of CD4+ T cells, CD8+ T cells, NK cells or alveolar macrophages do not influence x31-induced BM B cell loss. Furthermore, although IFNs potentiate the hemosuppressive effects of TNF-α and LTα on myeloid cells in vitro (11, 12), both IFN-γ−/− and IFNαβR−/− mice were found to undergo BM B cell loss to the same extent as WT control mice (data not shown). Thus, CD4+ and CD8+ T cells, NK cells or peripheral macrophages, and cytokines IL-15 and IFNs are not critical in mediating x31-induced BM B cell loss. Although BM B cell loss is prevented in mice deficient in TNF-α and LTα, the inability to alter this phenotype by depleting peripheral cell populations in vivo suggested that these cytokines may mediate this effect locally, from within the BM environment. For this reason, the production of TNF-α and LTα in BM leukocytes from AF- and x31-inoculated mice was assessed. Both TNF-α and LTα mRNA could be clearly detected in BM leukocytes from both AF- and x31-inoculated mice, but there was no real increase in the abundance of these cytokine mRNAs in BM obtained from x31-infected mice, compared with AF-inoculated mice, on any day post inoculation (Fig. 6⇓). This was relative to constitutive and equal levels of mRNA for the housekeeping gene GAPDH (Fig. 6⇓). Similarly, there was also no significant increase in intracellular TNF-α cytokine staining of BM leukocytes as assessed by flow cytometry, and no detectable increase in serum TNF-α levels in x31-infected mice over the course of infection (data not shown). The fact that BM-derived TNF-α and LTα are not increased during x31 infection suggest that other factors, in addition to TNF-α and LTα, may also contribute to the x31-induced BM B cell depletion. RT-PCR analysis of TNF-α and LTα mRNA expression by BM leukocytes. BM cells were harvested from five individual naive C57BL/6 mice, on days 1, 3, and 5 post x31 or AF i.n. inoculation. Total leukocyte RNA was isolated, cDNA was synthesized, and levels of TNF-α and LTα transcripts were assessed by RT-PCR. Data shown are ethidium bromide-stained agarose gels and are representative of two completely independently repeated in vivo experiments and two repeat PCRs for each experiment. We have demonstrated a transient, but significant loss, of BM B-lineage cells during influenza virus infection of mice (Fig. 1⇑). The BM B-lineage cell depletion occurs via the process of cell cycle arrest and probably apoptosis (Fig. 2⇑), and results in a significant decrease in viable, proliferating BM pre-B and immature B cells and a decrease in the HSAhighB220+ recent B cell emigrants in the peripheral blood (Tables I⇑ and II⇑). The transient nature of these effects indicates that BM B lineage cell reconstitution occurred at a rate consistent with normal B cell hemopoiesis, because the rate of pre-B cell turnover within the BM is estimated to be ∼17 × 106 cells/day (35). This indicates that BM B-lineage cell loss occurs due to apoptotic events, rather than due to altered hemopoiesis and B cell production, per se. It is surprising that some BM B lineage cell loss occurs during a secondary exposure to the same influenza virus. However, our recent data indicate that influenza virus-specific T cell numbers in the lung are considerably increased following a challenge with the same virus, suggesting a renewed induction of cytokine expression during secondary infection. Whether this also occurs within the BM is currently unknown, but under investigation. Nevertheless, it is notable that this increase in virus-specific T cells and potential burst of cytokine expression during secondary virus infection occurs irrespective of the presence of persisting influenza virus-specific Ab titers (S. Hou and L. Hyland, unpublished observations). Despite the well-known proliferative effects of TNF-α on diverse cell types, there are only a few reports providing evidence for a role for TNF-α in maintaining normal lymphoid cell homeostasis in vivo, and these are thus far limited to direct effects on T cells (44, 45). In this study, we have described a requirement for TNF-α in BM B lineage cell loss during virus infection in vivo. Interestingly, we have also shown a requirement for both TNFRs for inducing maximal BM B lineage cell depletion. These data support the argument that both TNFRs play important roles during virus infection in mice (31), and that signaling via the non-death domain TNFR2-p75, contributes significantly to the biological effects of TNF-α in vivo (42). Moreover, our data are consistent with previous observations that TNFR1-p55 and TNFR2-p75 can mediate antiproliferative effects on mature hemopoietic progenitor cells as well as primitive hemopoietic progenitor cells respectively in vitro (46). Our data further indicate a requirement for both TNFR in regulating early and intermediate developmental stages of B lineage cells within the BM environment, which has not been shown previously. The clear involvement of TNFR2-p75 may also indicate a role for cell-associated or membrane-bound TNF-α because it has been shown that membrane bound TNF-α is important for triggering the non-death domain containing TNFR2-p75 (47). Our demonstration that LTα is required for BM B lineage cell loss during virus infection illustrates a unique physiological activity of LTα that cannot be explained on the basis of the developmental defects evident in peripheral lymphoid tissues of LTα−/− mice. Although LTα and TNF-α can exert hemosuppressive effects on myeloid progenitors in vitro (11, 12, 13) no changes in BM myeloid populations were evident in x31-infected mice. This discrepancy may be explained by a requirement for other contributing factors, including important growth factors that may be absent in in vitro culture experiments. BM B cell loss in influenza virus-infected mice did not appear to be due to alterations in B cell trafficking, because there was no increase in splenic, mediastinal lymph node or peripheral blood B220lowIgMhighHSAhigh cells, which represent recent immigrants from the BM (19). The fact that there was a concomitant decrease in HSA+B220+ cells in the peripheral blood, is consistent with the reduction of B220+IgM+ BM B cells (Fig. 1⇑), which further indicates that BM B cell loss most likely results from apoptotic cell loss within the BM environment. Furthermore, it is possible that immune-activated leukocytes such as Mφ could traffic into the BM and induce BM B cell loss. However, there is strong evidence which suggests that the impaired ability of TNF-α−/− mice to resolve inflammatory stimuli is due primarily to failure of efficient trafficking of inflammatory cells in these mice (48) and we demonstrated that TNF-α−/− mice were not resistant to influenza virus-induced BM B cell loss. Thus, our data is consistent with the interpretation that locally produced TNF-α and LTα mediate this B cell depletion phenomenon. Attempts to address which effector cells were responsible for inducing B cell loss during influenza virus infection indicated that this phenomenon is not altered by differences in absolute numbers of activated NK cells, CD4+ and CD8+ T cells. This is consistent with the fact that TNF-α and LTα are not exclusively produced by any one of these cell populations, and again suggests that these cytokines are acting via their expression from within the BM environment, such as by BM leukocytes. Indeed, both TNF-α and LTα have been shown to be present in cultures prepared from BM cells of humans with aplastic anemia (49) and BM macrophages and stromal cells are known to be able to produce TNF-α (50). However, the lack of an increase in these cytokines within the BM of x31-infected mice indicates that the TNF-α and LTα may mediate their effects via an indirect manner. It is currently unclear what other factors may influence the severity or duration of the BM B lineage cell depletion that occurs during influenza virus infection. IL-7, Abl protooncogene, limitin, CD24 expression, and hemopoietic growth factor cytokines such as fetal liver tyrosine kinase-ligand, can all influence the survival and proliferation of B lineage cells (51, 52, 53, 54), but any possible contribution by these or other factors to the phenomenon described in this study remains unknown. Moreover, cytokine-induced changes in the expression of intracellular anti-apoptotic factors would also be expected to contribute to sensitivity or resistance to TNF-α and LTα-mediated apoptosis, but expression of these molecules has not yet been defined in this model. Consequently, we are currently defining the expression of proapoptotic and survival factors in BM B lineage cells derived from x31-infected and AF-inoculated mice. Finally, it is interesting to speculate whether a similar BM B cell depletion occurs in humans, and if so, whether it affects the immune response to the virus infection, or to a concomitant secondary infection, especially during prolonged infection of immunocompromised elderly hosts. Although the B cell loss appeared to affect mostly pre-B and immature B cells, there was clearly no loss of mature splenic and lymph node B cells in mice (data not shown). Consistent with these observations, WT mice (which undergo BM B cell depletion), and TNFp55−/−p75−/− mice (which show no depletion of BM B cells), both generated similar levels of influenza-specific Ig (data not shown). Thus as expected, virus-induced BM pre-B/immature B cell loss in mice does not influence the ability of existing mature splenic and lymph node B cells to generate effective antiviral Abs. Importantly, severe influenza pneumonia in humans results most commonly from complications arising due to secondary bacterial infection (55, 56). Diminished BM B cell numbers during a secondary bacterial infection would be expected to have some adverse effects for the host, and in fact mice coinfected with influenza virus and Staphylococcus aureus often have fatal consequences (57, 58), as do infected immunocompromised elderly human hosts. Furthermore, influenza virus infection is known to have life-threatening consequences for recovery and success of BM transplantation in humans (59). We thank Janet Ruby, Linda Bendall, Michael Marino, David Chaplin, Hilary McKenna, Eilidh Williamson, Philip Hodgkin, and Guna Karupiah for critical reading of the manuscript. We acknowledge Daniel Hirschstein, Steven Braddy, and Alan Alpert (Immunex) for assistance with flow cytometry. We thank the staff at Institute for Animal Health, Immunex, and Westmead Animal Facility for animal husbandry. We gratefully acknowledge Dr. Maryna Eichelberger (Johns Hopkins University, Baltimore, MD) for x31 virus, Charles Rauch (Immunex) for LZ proteins, Roche Diagnostics (Mannheim, Germany) for the gift of Clodronate, Dr. Tanaka (Osaka University Medical School, Osaka, Japan) for mAb TMβ1, Dr. Cobbold (Sir William Dunn School of Pathology, Oxford University, Oxford, U.K.) for mAb YKIX 716.13, Dr. Michael Marino (Ludwig Institute for Cancer Research), and Dr. David Chaplin (Washington University School of Medicine) for TNF-α−/− and LTα−/− mice, respectively. ↵1 This work was supported by Grant 97/132 from the Health Research Council of New Zealand, Grant MR36175 from the New Zealand Lottery Grants Board (to L.H. ), Otago University Research Grants KODB01 and KNAB60 (to L.H. ), a University of Sydney U2000 Fellowship (to L.S. ), Edward Jenner Institute for Vaccine Research, and Immunex. ↵3 Abbreviations used in this paper: BM, bone marrow; LTα, lymphotoxin-α; i.n., intranasally; p.i., postinfection; WT, wild type; L, ligand; pro-, progenitor; pre-, precursor; HSA, heat-stable Ag; AF, allantoic fluid; EID50, 50% egg infectious dose; RSV, respiratory syncytial virus; OPG, osteoprotegerin; LZ, leucine zipper; RANK, receptor activator of NF-κB. Barrett, T., S. C. Inglis. 1991. Growth, purification and titration of influenza viruses. B. W. J. Mahy, ed. Virology 119 Oxford University, Oxford.